Crunch, crunch, crunch. A dozen eager tourists walking up a stony hillside, making more noise than 100 elephants. A few feet from the top our guide tapped the side of his shoe, the sign for us to engage super-silent mode. We were tracking desert rhino in Namibia, and one of them was just over the hill. Our day had started with a 5:00 am wake-up call at Wilderness Safaris’ Desert Rhino Camp in the Palmwag Concession of Kunene (Damaraland). By 6:00 am we were in the 4×4 and our guide Bons Roman was explaining that the gazillions of rocks around us were fallout from a volcanic eruption 130 million years ago. They’re dark basalt with some quartz and iron, which has oxidised over time to give them their rusty colour. Crackle, crackle, hiss. Bons got a call on the radio from three Save the Rhino Trust (SRT) trackers. Their job is to monitor, protect and understand the largest population of desert-adapted, free-roaming black rhino in Africa. They track by vehicle and then on foot, the old-fashioned way, without collars, chips or telemetry. Committed to the rhinos’ survival through sustainable eco-tourism, Wilderness Safaris partners with SRT and helps fund its conservation work. 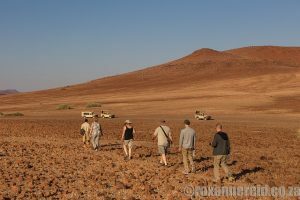 The spin-off is that SRT locates rhinos to thrill guests on a game drive from Desert Rhino Camp. It took us about 30 minutes to get to where the trackers were watching a rhino. At the foot of a rocky koppie we got out of the vehicle and started our crunch-crunch climb. At the top we edged forward in a crouch with one of the trackers, a few people at a time. We needed stealth mode because although a rhino’s eyesight is poor, its hearing is sharp. We were trying not to disturb it. And given that black rhinos can have a short fuse, we obviously didn’t want to trigger a charge. Below us in the valley about 150m away, surrounded by red rocks and a scattering of welwitschia plants, a desert-adapted black rhino was browsing on a euphorbia. This bush is poisonous but the rhino’s digestive system is tough enough to handle it. “It’s also softer and easier for them to eat when they get older,” Bons said. Our rhino was Getaway, a 40-year-old male born in 1975, so now nearing the end of his life. Although he was lord of a 409-square-kilometre territory, here at a freshwater spring he didn’t have far to travel between food and water. And to an old man, this obviously seemed like a good plan. Getaway got his name because he’s ultra sensitive to intrusion, and liable to bolt if disturbed. That’s why our guide and the trackers wouldn’t take us any closer. Our group maintained a suitably reverent hush, so quiet we could even hear him chewing. It was overwhelming and humbling to watch this magnificent free-roaming creature in his own environment, to know how ancient his species is and yet how threatened with possible extinction by poaching. There are now only about 5000 black rhinos left in the whole of Africa. Sadly, he was de-horned in 2014, a necessary violation. Although Namibia doesn’t yet have as serious a poaching problem as South Africa, which lost 1215 rhino to poachers in 2014, poaching has intensified in recent years so most of Damaraland’s free-roaming desert rhino have been de-horned to keep them safe. We watched, wordless, for about 45 minutes, cameras whirring or softly clicking, a Ruppell’s korhaan croaking nearby like a desert frog. The trackers later claimed the rhino hadn’t been aware of our presence. It’s important not to disturb them; SRT and Wilderness Safaris have divided the land into four sectors, and they alternate sectors so they don’t stress the animals too much by visiting the same individual too often. Would I have liked to get a bit closer to the rhino? Yes. 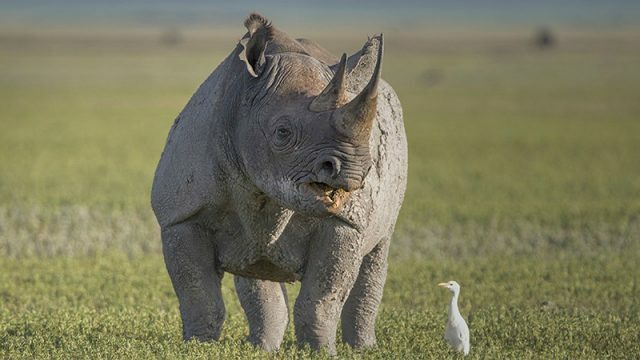 Would I have liked to see a rhino whose horns hadn’t been removed? Yes. But it’s not about me, it’s about the rhinos and conservation. If keeping our distance is what it takes to ensure they don’t become habituated and therefore easy targets, I support that. If removing their horns is what it takes to keep them alive, safe from poachers, I’m behind that too. Later we stopped in a patch of shade where camp chairs had been set up in a semi-circle. “Welcome to the Mopane restaurant, recently renovated by elephants,” Bons grinned, pointing to some broken branches. The wind had come up, and Namaqua sandgrouse burbled overhead while field tracker Denzel Tjiraso told us more about SRT’s work. They’re closely monitoring a healthy breeding population here, some of them mothers with calves. Every time they spot a rhino they note the details in an ID book – where it’s found, what it’s doing, which animal it is. They identify individuals by horn shape and ear notches, which they get from fighting or barging through sharp bushes. The trackers also note its condition on a scale of 1-5. “We see an individual rhino more often in years of good rain, like 2009 and 2012, less often in years of bad rain like 2013 and this year when they migrate in search of food,” Denzel said, holding up graphs to underscore his point. 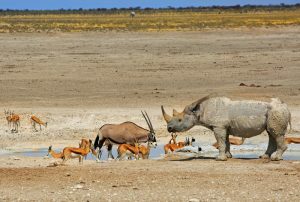 Rhinos aren’t the only ones benefiting from the responsible tourism efforts of Desert Rhino Camp. 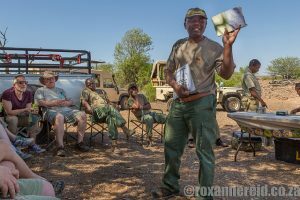 Wilderness Safaris has partnered with the Torra, Sesfontein and Anabeb conservancies that administer the Palmwag Concession, where it has a 20-year lease agreement. Both the lease fee and a percentage of income from bed nights go back to the communities, giving them a direct interest in the sustainability of ecotourism. 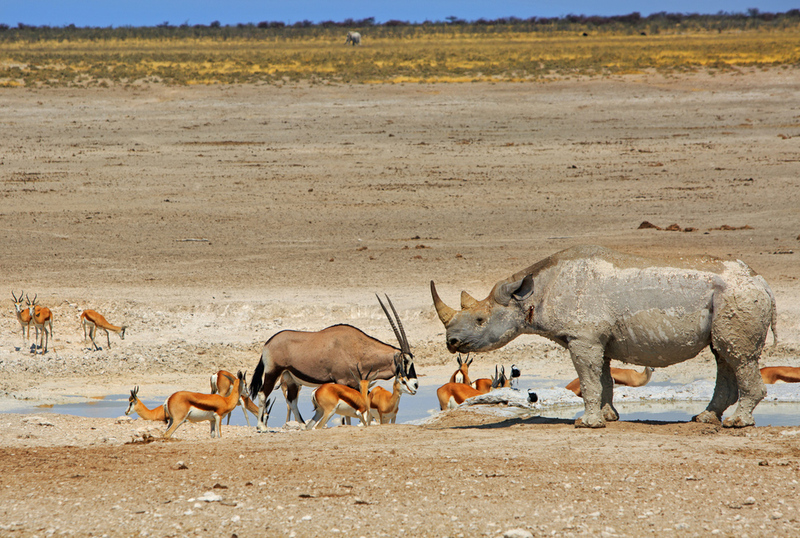 And that can only be a good thing for the future of Namibia’s desert rhinos. Roxanne was a guest of Desert Rhino Camp for two nights, but the opinions expressed are her own.